All newsletters since December 2005 are available as PDF files. See Archive list below. Click on the one you want to see (December 2013-current) or download (December 2005-November 2013). Catch up with recent email newsletters via the Mail Chimp Email Campaign Archive page. Erella Teitler Not Forgotten is a solo exhibit representing a cultural history. Erella's 26 collage and mixed-media artworks incorporate photographs of refugee families from Arab lands depicting Jewish life in the Middle East and North Africa at the beginning and middle of the 20th century. April 1 - May 20, 2015 Oshman Family JCC, Palo Alto CA. Shawn K. Riley had her mixed-media works accepted in two Women Painters West exhibits: Arena 1 Gallery, Santa Monica, January 10-24; and Creative Arts Center Gallery, Burbank, May 8-28. Shawn also participated in the International Juried Exhibit WaterWorks II at Porch Gallery in Ojai CA from May 9 - June 8. The exhibit then traveled to Glendale Community College Gallery from September 12 - October 10, 2015. Marian Devney's collage and assemblage works have been featured in three exhibits this year: Collage and Mixed-Media Juried Open at Buenaventura Art Gallery; and Ventura Art Council's invitational exhibits Over the Top and A Cut Above. Susanne Belcher has three pieces in the VWS Holiday Showcase The Gift of Art at the Thousand Oaks Community Gallery thru December 30, 2014. Susanne also had work accepted in Women Painters West Winter Exhibition at Santa Monica's Arena 1 Gallery, January 10 - 24, 2015. Erella Teitler exhibit Not Forgotten at the Gindi Hall at Dortort Center, UCLA Hillel, 574 Hilgard Ave. L.A 90024. Reception October 23, 7-9. 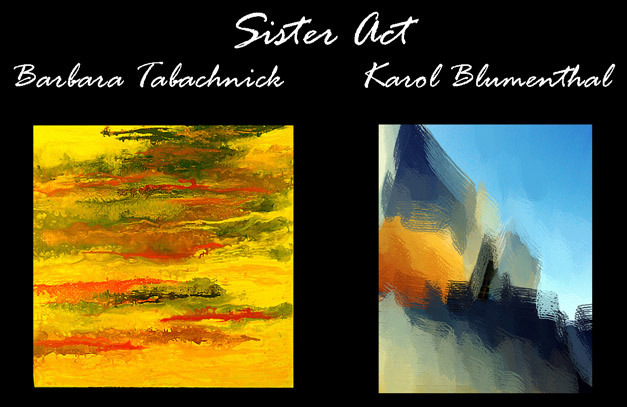 Barbara Tabachnick and Karol Blumenthal shared a show, Sister Act, at the Council Art Gallery of the National Council of Jewish Women in Los Angeles. The show, with about 75 art works (paintings, encaustics, digital art and mixed media pieces), ran from August to October, 2014. Liza Julien will have her work "Up-stream" (pictured left) in the Bountiful/Davis Art Center Nothing Flat group exhibit from July 11 to August 29 in Farmington, Utah. Liza will also be participating in the Urban Arts Festival in downtown Salt Lake City at the Gateway on July 19th. 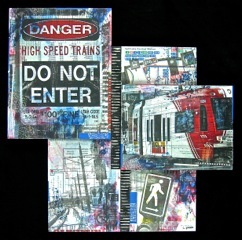 Her booth will featuring her mixed media photo collage and transfer urban-themed works as well as abstracts. Erella Teitler took part in Sisters a group show celebrating women and their unique contributions and creativity around the world. March 6-28, 2014 CASA Magazine Gallery, Santa Barbara, CA. Susanne Belcher, Joan Foster and Carole Gillin all have work in the exhibit Local Color at The Galleria at Hillcrest Center for the Arts in Thousand Oaks, CA, showing July 5-October 7, 2013. Susanne Belcher's recently published coauthored book Looking for 527 (with nature writer, Christine Baleshta) was chosen for Editors' Picks by Story Circle Book Reviews (available on Amazon.com, eKindle). Sharon Brooks and Tanya Mikaela were part of Equestrian Spirit: The Heart of the Horse at Ethos Gallery in Hollywood, California in April. Smadar Knobler, J. Natasha Kostan, Barbara Tabachnick, Mara Thompson, and Joan Vaupen all participated in the Southern California Women’s Caucus for Art’s (SCWCA) exhibit, Plenty, at California State University Northridge West Gallery in April. Nancy Goodman Lawrence’s work is featured in Geo Graphic: A Book for Map Lovers, released in April by Spanish graphic design publisher Index Book. Launa Romoff's work appeared in The Spirit of Place: Memorable Interior Spaces exhibit at La Galeria Gitana in San Fernando, California, in May. Erella Teitler exhibited in Changes at the Pasadena Central Library, in Pasadena, California, in May. Her work was also on display in About Women at the Studio Channel Islands Art Center in Camarillo, California, in May. Susan Gesundheit is showing her Bottled Energy series of monotypes at Electric Lodge in Venice CA through June 16, 2014. Susanne Belcher has two collages in International Women's Day juried exhibition hosted by LarkGalleryOnline thru April 6 at the West Hollywood City Building and was interviewed by Ay Atelier in Malibu (read e-interview). Pictured right: “Homeless Flight”. Susanne also has several of her pieces in Visual Dialogues at Sulkin/Secant Gallery, Space T-6, at Bergamot Station, April 1 - 27. Liza Julien had three works juried into the Bountiful/Davis Art Center 2013 Annual Statewide Competition in Farmington, Utah. 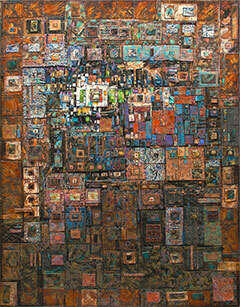 The exhibit features the works of 80 Utah artists and runs from February 22 to March 29, 2013. More information: bdac.org, 801-451-3660. Pictured right: “Trackside Turbulence”. Mara Thompson will be taking part in a 3-artist exhibition at Hale Arts Space in Santa Monice.Arts Space, EDGEMAR Complex, 2443 Main Street, Santa Monica, CA 90405. Opening hours: Thur–Sat, 10am–7pm. Susanne Belcher had one of her pieces (above) chosen for Portal II: SustainAbility, an environmental art exhibition sponsored by Lark Gallery Online and hosted by ART 4 ALL PEOPLE in Malibu (19562 Pacific Coast Hwy). February 4 thru March 20, 2013. 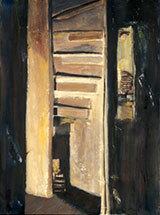 Marian Devney has been accepted into Topanga Canyon Gallery’s 2013 Juried Open exhibit, January 9-27. 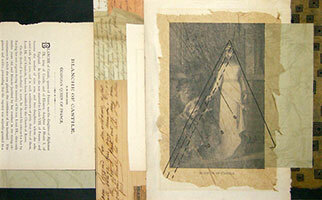 In March, Marian will introduce assemblages in a group show at Blades Salon in West Hollywood. Pictured right: "Absolutely"
Marian Devney, Barbara Margolies, and Darlene Mellein had work accepted into Topanga Canyon Gallery's 2013 Juried Open that ran January 9-27 in Topanga, CA. Teri Dryden won third place in the Mazin Annual Art Exhibition at the Patio Gallery in Louisville, KY that ran through January 8. Teri also had work in the 56th Mid-States Art Exhibition at the Evansville Museum of Art in Evansville IN, through March 3. Erella Teitler was part of the group show Jewish Ritual: Rethinking, Renewed at the San Diego Center for Jewish Culture Viterbi Family Galleria in La Jolla CA, through March 6. Marthe Aponte, Mary Becker, Sharon Brooks, Marian Devney, Barbara E. Jones, Lore Eckelberry, Marilyn B. Jordan, Kwei-lin Lum, Tanya Mikaela, Ulrica Bell Perkins, Shawn K. Riley, Toby Salkin, Marjorie Sarnat, Anita Van Tellengen, Christel Thompson, and Barbara Zager were part of Experimental Artists II's Dwellings exhibit at Antelope Valley College Art Gallery, Lancaster, CA, in February. The exhibit included an artists' talk at the opening reception. Lore Eckelberry and Marjorie Sarnat were part of Nine Dimensions Art Exhibition at Gallery 800 in North Hollywood CA, through March 17. 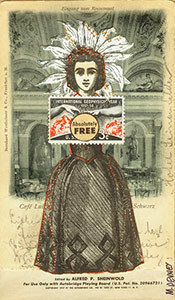 Liza Julien has work in Signs & Scenes at Utah Arts Festival Gallery, Salt Lake City, March 15-April 12. 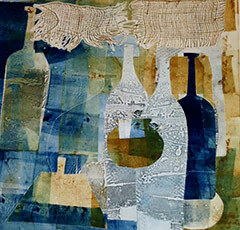 Marjorie Sarnat's mixed-media work Out of the Blue won second place in Thousand Oaks Art Association's 2013 Open Juried Show that ran through February. The juror was Mark Wood. Marjorie Sarnat won first place for her painting Crowdsourcing in the Women Painters West Into the Blue exhibit at the Arena 1 Gallery in Santa Monica, juried by Ann Thornycroft and ran through December 15, 2012. Marjorie has also just released her newest book aimed toward nurturing creative thinking in children. Creative Genius: How to Grow the Seeds of Creativity Within Every Child is highly acclaimed by prominent educators, and its guide to understanding how creativity works is useful for adults, too. Available now on Amazon. Susan Gesundheit had 28 a solo show at the National Council of Jewish Women/Los Angeles, 543 North Fairfax Avenue, Los Angeles, CA 90036. Pictured left: “Return to Sender” Elvis Tallis Series, 18" x 18" monotype. Karen Robbins has two works (Comfort and Veiled) accepted into Brand 41: Works on Paper showing at Burbank Creative Art Center. Pictured right: “Veiled”. Natasha Kostan had five works accepted in the LarkGallery OnLine 2012 all-media online competition The Art of Now and received an Honorary Mention. 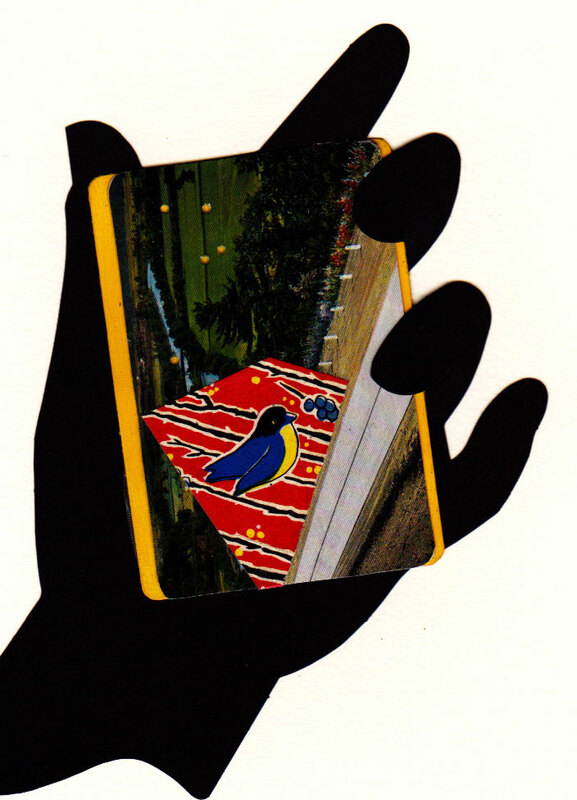 Jo Ann Koch had three works accepted in the LarkGallery OnLine 2012 all-media online competition The Art of Now. Susanne Belcher received an Honorary Mention in the LarkGallery Online international e-Competition, The Art of Now. 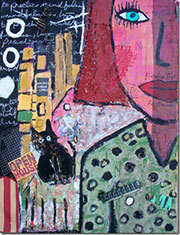 Susanne also had two pieces accepted into Brand 41: Works on Paper Memories (opening reception October 5, 7-9pm at the Burbank Creative Arts Center); and is one of the featured artists in the Valley Visions exhibit at the Canoga Park Youth Arts Center (opens Sept. 30 - Oct. 6, 2012). 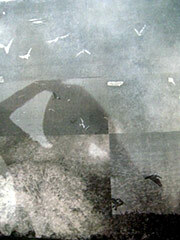 Pictured left: “Shore Watch”, image transfer M/M collage, accepted into Brand 41. Harriett Lahana was juried into the California Open Exhibit at Tag Gallery Bergamot Station; the show was juried by Meg Linton of Otis. Harriet was also accepted into the Lark Online competition and is currently showing (September) at La Frite Restaurant in Woodland Hills CA. Esther Pearlman's paintings are on display at Café Vida in Pacific Palisades CA through September 20. Launa D. Romoff's work was shown in Laguna and Barnsdall Park this summer. Launa's work is also part of From Abstraction to the Sublime at La Galeria Gitana in San Fernando CA through October 12. 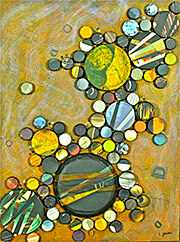 Teri Dryden had two pieces in National Collage Society's 28th Annual Juried Exhibition held this summer at the Berman Museum in Collegeville, PA, and online at nationalcollage.com. Teri Dryden, Launa D. Romoff, and Mara Thompson had homage/collaboration pieces in the Franklyn.calm, Franklyn.excited, Franklyn.artist show at Andrew Shire Gallery, Los Angeles, this summer. Donna Geist Buch exhibited in The New Girls at Topanga Canyon (CA) Gallery in August. 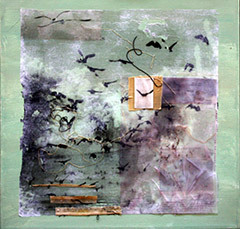 Barbara McIntyre created an assemblage installation at Sylvia White Gallery, Ventura, CA in August. Barbara McIntyre's and Melinda Warren's work was part of the TAG Gallery, Santa Monica, CA, 2012 California Open Exhibition in August. Erella Teitler's work appeared in the MarkMaker group show held at Thousand Oaks (CA) Community Gallery in August. Donna Geist Buch, Barbara E. Jones, Marilyn B. Jordan, and Toby Salkin's group show, Artists Portal, was held at the Madrid Theater, Canoga Park, CA, in July. Marilyn Stempel's solo show, CMYK, was at the Madrid Theater, Canoga Park, CA, in June. Launa D. Romoff and Natasha Kostan exhibited at the International Women’s Day Party and Art Exhibit on March 11 at the Pacific Design Center, West Hollywood, CA. The event was co-sponsored by Lark Gallery Online, which now also represents Launa. Marilyn Stempel had an installation of her artwork at the Chatsworth, CA, Metrolink Station through the month of February. Susan Gesundheit had two pieces in Valley Watercolor Society’s So Cal and So On! 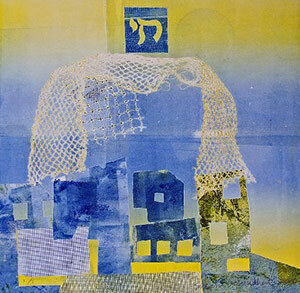 exhibit at Gallery 800, North Hollywood, CA, in February; and a monoprint in Jewish Women Artists Network's The Song of the Land, Los Angeles, exhibit at Hebrew Union College, Los Angeles, from February 23 through May 31. Erella Teitler exhibited with other JAI artists at Hebrew Union College. Jewish Ritual:Rethinking, Renewed until December 31, 2011. Andrea Raft, Diane Karpel, Erella Teitler and Toby Salkin exhibited Sacred Places of the Heart at the Slutzky Art Gallery, at the Merage JCC of Orange County. Susanne Belcher had a solo show at Coif 2 Salon & Studio, 4364 Tujunga Ave., Studio City. Ben Goldman had his art juried into the International Society of Acrylic Painters (ISAP)14th Annual Open Exhibition in Santa Cruz California. This is the 8th successive year that he has had that honor. Ben was also selected to participate in the ISAP Paso Robles Signature Exhibition in Paso Robles, CA. Rachelle Mark exhibited at Onyx Salon, Sherman Oaks through May 19, 2011. Rachelle also exhibited in Mixed Media: Trio at the Judith Kaufman Gallery at the El Portal Theatre, North Hollywood in May 2011. Dafna Gilboa exhibited in Spinning Wave at USC Hillel Art Gallery, Los Angeles, April 2011. Susan Gesundheit and Nancy Goodman Lawrence exhibited at the Hebrew Union College exhibition entitled ...L'chi lach, on your journey I will bless you... January - May, 2011. HUC, 3077 University Avenue, Los Angeles. Susan and Nancy also exhibited at The Rashi Effect: Artist As Commentator through April 13, 2011, at the Platt Gallery, American Jewish University, Bel Air. Donna Geist Buch won the top award at Women Painters West Memento Mori exhibit at VIVA, November 2010. Other CAA members who won awards included Susanne Belcher and Nancy Goodman Lawrence. Erella Teitler was accepted to JAI (Jewish Artist Initiative). She will take part in a juried exhibit at Hebrew Union College. The Memory and Transformation Exhibit will run through December 31, 2010. Erella took part at Brand 39 juried exhibit through October/November 2010, and she also has two pieces at Women Painters West Memento Mori exhibit at VIVA. had work featured in Green/Vert/Verde - Environmentally Inspired, an invitational group exhibit about renewal and recycling. Presented by the Arts Council of Conejo Valley in the Galleria at Hillcrest Center for the Arts, Thousand Oaks. July 8 - Sept 20, 2010. Susanne Belcher had two pieces accepted in the Four Faces of VIVA exhibit and won the 3rd Place Award for her piece, Reminiscence (pictured right). June/July 2010. Susanne Belcher, Harriett Lahana, along with other CAA members, got several pieces each juried into WPW’s Encino Terrace venue opening August 12 through January 2010. Picture right: Journey Upward” by Susanne Belcher. (mixed media on canvas, 40" x 30").